Edward the Confessor was the last Anglo-Saxon king who could trace his ancestry back to King Alfred the Great and King Cerdic of Wessex. He was the great-great-great grandson of Alfred and he died childless, leaving England open to conquest from overseas. Edward’s father was Aethelred the Unready, the hapless king who was besieged by the Vikings on all coasts. In 1002, he was widowed and contracted a marriage with Emma of Normandy, the sister of Richard, Duke of Normandy. Edward was born at Islip in Oxfordshire within the first two years of his parents wedding. Edward’s mother was a formidable woman but his father was not someone he could look up to and he may even have been ashamed of him. Aethelred was in an impossible situation with all the attacks and when Edward was about ten, his father was deposed and the whole family had to go into exile under the protection of Edward’s uncle in Normandy. Aethelred was restored to the throne of England in 1014 and Edward was given a chance to serve his future subjects. Instead of appearing in England himself, Aethelred sent Edward to represent him at great risk to Edward’s life. Edward carried out the mission well and the Witan (council) banned any future Danish kings due to his model behavior. But two years later, Aethelred had died and Edward and his brother Alfred were back in Normandy. Their half brother, Edmund Ironside was fighting to keep the throne from the Danish King Cnut. By the end of 1016, Edmund was dead and Cnut convinced the Witan to elect him King of England. In order to keep her place of power, Edward’s mother Emma married King Cnut. Emma made Cnut swear no sons by any other wife or mistress could inherit the throne other than her sons, in essence abandoning Edward and Alfred. She was to have a son Harthacnut in 1018 who was to become her favorite. Edward and Alfred were in exile and in limbo and the only one keeping them from possible assassination was their mother. Edward and Alfred grew to manhood in the custody of their uncle who didn’t want to risk sponsoring their return to the throne. Cnut died in 1035 and their prospects turned a little brighter. Cnut’s illegitimate son, Harold Harefoot had seized the throne but Emma was fighting to get her son Harthacnut on the throne. Harthacnut was in Denmark and was taking his time coming back. In 1036, Edward and Alfred both returned with forces to England. Edward turned back realizing he was outnumbered. Alfred landed with larger forces but was greeted by Godwin, Earl of Wessex. Godwine was the most powerful earl in the kingdom and an alliance between the sons of Aethelred and King Harold Harefoot was a threat to his position. Godwin attacked and decimated Alfred’s forces and took custody of Alfred. He had Alfred’s eyes gouged out, unmercifully mutilating him. Alfred was taken to the monks at Ely and left to die of his gruesome wounds. This may have deterred Edward from trying again to gain the throne and he may have felt guilty about the death of his brother. One thing is certain, he never forgave Godwin for murdering his brother. The English soon grew tired of the antics of Harthacnut and Harold Harefoot. Harthacnut had finally prevailed and ruled as King from March 1040 until his death at a drunken wedding celebration in June 1042. Edward was in Normandy when he got the news. He returned to England and the Witan elected him King. He was enthroned at Canterbury and later crowned at the Old Minster at Winchester on April 3, 1043. Edward needed Godwin of Wessex and his power base to shore up his own power. Godwin had escaped being punished for Alfred’s death by giving gifts to Harthacnut and insisting that Harold Harefoot had made him do it. At the very least, Edward knew Godwin was responsible for this brother’s death. Edward needed all the help he could get to fight a looming threat of invasion by Magnus of Norway. Edward strengthened the naval fleet and was on alert every year until Magnus died in 1047. In the meantime, Edward’s mother Emma may have conspired with Magnus. This was a massive betrayal by Emma and in mid- November 1043, Edward and the most important nobles rode to Winchester to take the treasury keys away from Emma who had guarded the treasury since Harthacnut’s death. Edward let her live out the rest of her life in relative peace but with no authority. From 1046 to 1051, Edward was in a continuous power struggle with Godwin. His only saving grace was the family was divided amongst themselves. Edward detested Godwin but knew that civil strife was the only answer to the struggle and he didn’t want to risk starting a war. Earl Godwin’s ambition knew no bounds and he set about carving out earldoms for his many sons and persuaded Edward to marry his daughter Edith. In 1051, Eustace of Boulogne, brother-in-law to Edward, made a state visit and started a brawl in Dover with the townspeople. Eustace’s motives are a mystery. Edward ordered Godwin to ravage Dover and the surrounding area. He refused and actually brought his army to defy Edward. Edward raised a larger army and Godwin’s support began to waiver. Godwin and his sons refused to come before the Witan and explain themselves. Edward gave them five days to leave the country. They left for Flanders and Edward banned Edith to a nunnery. Edward’s victory seemed complete but there was now a power vacuum in the South which Edward had a hard time filling. Also in 1051, it’s possible that young William, Duke of Normandy visited England and Edward may have promised him the throne at this time. In 1052, Godwin and his sons returned and invaded. Edward was forced to negotiate, restoring Godwin and all his sons and recalling Edith from the nunnery. Seven months later Godwin collapsed and died of a stroke while dining with Edward. Edward never fully recovered from this invasion and seizure of his power by Godwin. After the great Earl’s death, his son Harold Godwinson stepped in to fill the void. In the last ten years of Edward’s reign, Harold Godwinson became the foremost general in the kingdom, mostly by fighting the Welsh. Edward withdrew more and more into religious life and concentrated on building his legacy, West Minster on the north bank of the Thames. He cultivated a reputation for sanctity and may have initiated the practice of the king touching and healing people with “the king’s evil”, scrofula, a form of tuberculosis. Kings were to follow this practice until the 18th Century. He recalled his nephew Edward the Exile from Hungary, who mysteriously died shortly after arriving in England leaving a young son, Edgar Aetheling and daughter Margaret, who was to become Queen of Scotland. Edward sent Harold Godwinson to Normandy, possibly to assure William of Normandy he would inherit the throne. William possibly made Harold swear he would act as regent until he could come to England to claim his inheritance. This saga is told in the Bayeux Tapestry. Edward managed to prevent Godwin and his power hungry sons from seizing total power but was able to use the best of their abilities to his advantage. He was upstanding and pious, making him a cut above some of the ruthless and treacherous men around him. He came to the throne in his forties, ruled for 24 years and managed to consecrate his beloved West Minster on December 28, 1065. He died in his sixties on January 5, 1066. Harold Godwinson exploited the reality of the situation on the death of Edward with the country facing invasion by the Norwegian king and William of Normandy. He had himself declared king by the Witan. The new West Minster saw the funeral of Edward and the crowning of Harold. Harold was to lose the throne to William of Normandy at the Battle of Hastings in October of 1066. Rumors of miracles attributed to Edward began before he died. It was believed by many he was celibate due to his childless marriage. “The Life of King Edward” commissioned by his wife Queen Edith was instrumental in recording his holy life. There was scant evidence of miracles before his death and even scantier proof and downright fabricated miracles after his death, such as cures at his tomb and visions by others. More evidence of miracles does not appear until 1134. Canonization was sought in 1138-1139 but the Pope was not convinced. After 36 years, the body of Edward was disinterred and said to be intact with his long white beard curled upon his chest. This was a convincing sign of a Saint. In 1161, King Henry II and Westminster requested canonization from Pope Alexander III and he approved Edward as a Saint and Confessor. 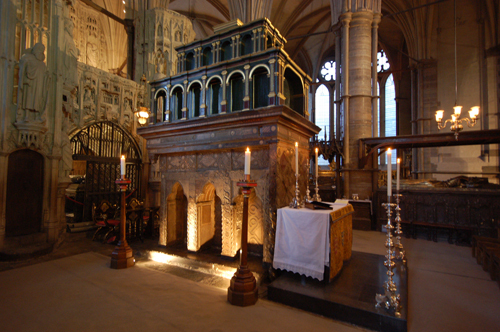 In 1269, King Henry III translated the remains of Edward to his new tomb in the newly rebuilt Westminster Abbey. If only I was a screenwriter! 😀 Or knew any, haha! This gives me a different slant on 1066. Thanks very much. So much treachery and cruelty. You’re welcome Gerald. Yes, things were a little different back then.